Lisa Marie Presley Hits Red Carpet with Son Benjamin -- See the Elvis Resemblance? Strip away the aqua hair and Lisa Marie Presley's son looks a lot like his famous grandfather, the one and only Elvis Presley. The singer and son Benjamin Keough hit the red carpet together in Sin City on Thursday night, where they honored The King at the grand opening of The Elvis Presley Theater at the Westgate Las Vegas Resort and Casino. We never see Presley's son with ex Danny Keough out in public with her, so this was a very rare treat. Both Lisa Marie and Ben, 22, share the same baby blue eyes and Presley pout as their legendary ancestor. Lisa Marie opened up about her son's resemblance to her father with CMT back in 2012. "He does [look so much like Elvis]! He was at the Opry and was the quiet storm behind the stage. Everybody turned around and looked when he was over there. Everybody was grabbing him for a photo because it is just uncanny," she explained. "Sometimes I am overwhelmed when I look at him." "He's doing his own thing right now. I'm going to let him decide when he wants to go out and do what he wants to do," she also told Huffington Post about his musical aspirations. Benjamin is one of four kids. Presley also has daughter Riley Keough, 25, with Danny Keough ... and twin daughters Harper and Finley, 6, with husband Michael Lockwood. See what they all look like in the gallery above! 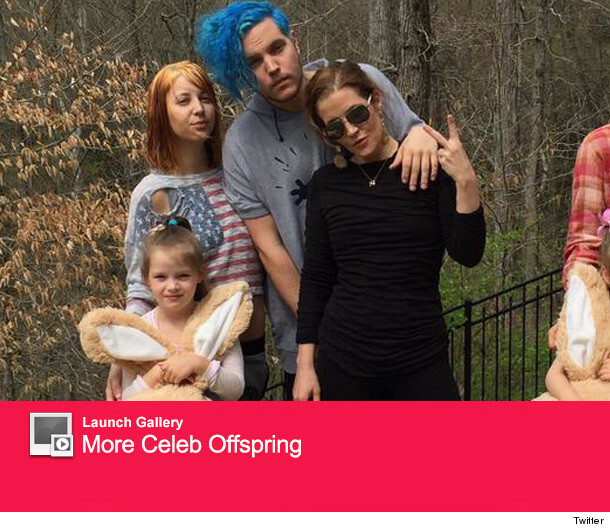 And check out the gallery below to see more celeb offspring. Riley Keough Drags Justin Timberlake in "TKO" Video!